As it nears 5pm we went back near the office to hear any news about planes. 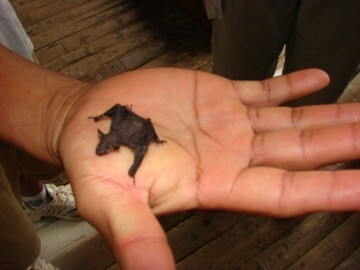 The manager is there with a baby bat on his hand. He believes it is now too late to hope for a plane. He reassigns some rooms and we go back to prepare to spend another night here. Tomorrow morning up to 3 smaller planes may be used to get us back to Shell. We’ll see. Charlotte and I have a discussion about using the internet and getting in touch with the guys taking care of computer co-op for us. I feel some reservation. I want to reenter the world of computers, internet, business, and America in a new way. I don’t want it to be drenched in worry, hurry, tension, difficulty, pressure and anxiety. It seems like an important moment. Like standing at the start of many paths, each one leading in a very different direction. I just finished reading John Perkins book, The World Is As You Dream It, Teachings from the Amazon and Andes. Charlotte is reading The Cosmic Serpent. We did go to the office and using a Spanish keyboard laptop computer and an ultra-slow internet connection and accessed Charlotte’s Office Computer and left a message on the screen for the guys to let us know if they needed anything from us. We checked email on Charlottes computer and started checking 500+ emails on Luke’s computer, but the horn for dinner sounded before we got done. Luis was working out the logistics for our travel in the morning. At dinner they served us all wine from Chile. The rest of the meal was delicious as well. We had a good conversation about the Awakening the Dreamer Symposium with the Frank and Pavithra from Germany and went over ideas about getting the Symposium happening more in Europe. At a table behind us were three Achuar men that had just arrived. Charlotte was taking their picture and learned who they were. They were some of the most important of all the Achuar leaders. The person at the back left is Roberto Peas. At the back right is Luis Vargas. 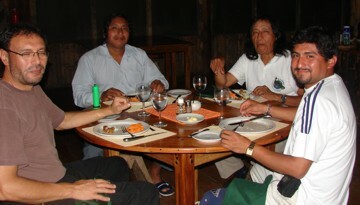 At the far left is Luis, the manager of Kapawi Lodge. 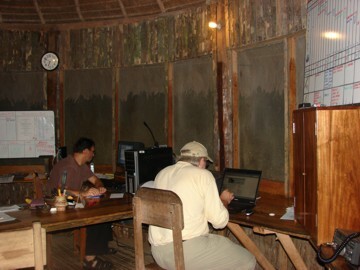 The man on the right is a scientist who has come to test the water and the septic system at the lodge. They had come for a meeting starting tomorrow with the leaders of all the Achuar communities in the area. Bill Twist will be flying in tomorrow to join them. They are part of the Achuar government and board that runs Kapawi Lodge and the indigenous tourism effort. They joined us after dinner and Charlotte recorded much of their presentation. We learned how they began their struggle against oil and mining operations and how their federation has grown. They were very knowledgeable about the world, politically and economically. They let us know how important eco-tourism is to their survival as they are trying to prove it is a viable and sustainable alternative to oil, timber and mining operations. The government of Ecuador long ago sold leases to the minerals under the Achuar part of the rainforest. There are two main tracts. One is owned by an Argentinean company. The other owned by Burlington Resources, a subsidiary of Conoco-Phillips and based in Texas. Kapawi Lodge was suppose to be turned over to the Achuar after 15 years (in 2012) but the owner died and the transfer happened last year. The Achuar have had 7 brilliant students training to become the management team at a tourism college in Quito for the past year but three months ago the funding was stopped by a non-governmental organization. The students are in their home communities and funding to get them back in school is badly needed. The Kapawi Lodge has never made money and is not likely to make money this year or next, but hopefully can begin to break even and become profitable in 2010. In hearing them talk, I felt so much. I saw wise men passionately protecting their culture from the threat of extinction. I saw the spirit and courage of a warrior standing above Ché Guevara. I saw an economic development pioneer finding a path to sustainability that could be a doorway for the world to be saved. It was such a privilege to be with them. We gave a big cheer when we learned that the plane they had been preparing in Canada last week had arrived in Quito today and may make it here as early as tomorrow. (later we learned it had been delayed). We wish them success with all our heart and soul. We get in boats and go down river. 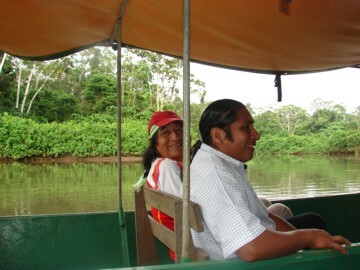 At the same time the Achuar leaders were heading up the river to their meeting.